If you grew up in the south (or had parents who did) you probably eat greens, black eyed peas, some form of pork and cornbread on New Year's Day. It's tradition. It's symbolic of good luck and prosperity. It's a comforting, humble meal. 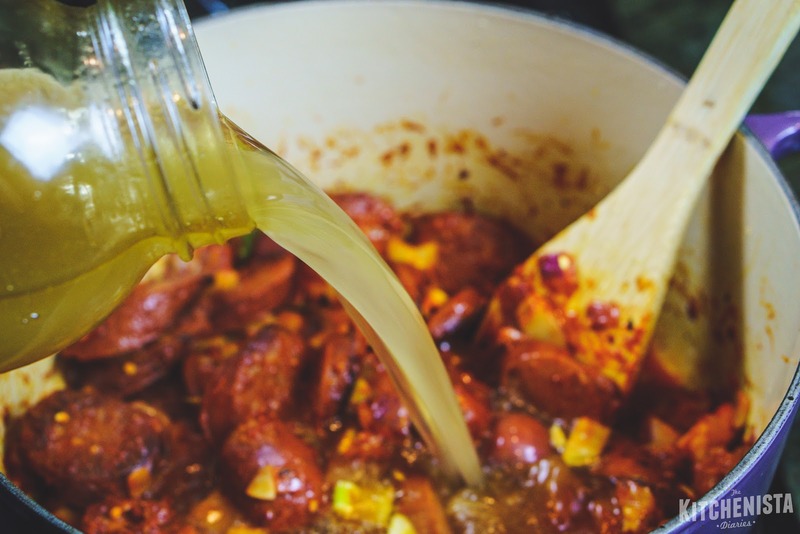 I don't know about you, but after two major holiday dinners back to back, nothing about standing over a pot of beans that I don't even like all that much is appealing to me. 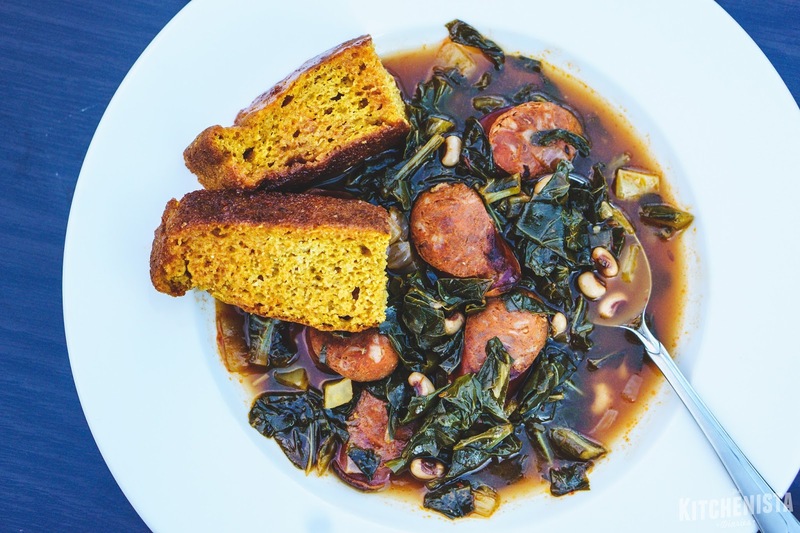 Making southern greens, with a New Year's hangover? So here's the cheat code. Why not have all of your traditional good luck foods in the same pot? (Minus the cornbread, but that takes all of 30 minutes to knock out on the side.) I brainstormed a few dishes and this was my favorite result. 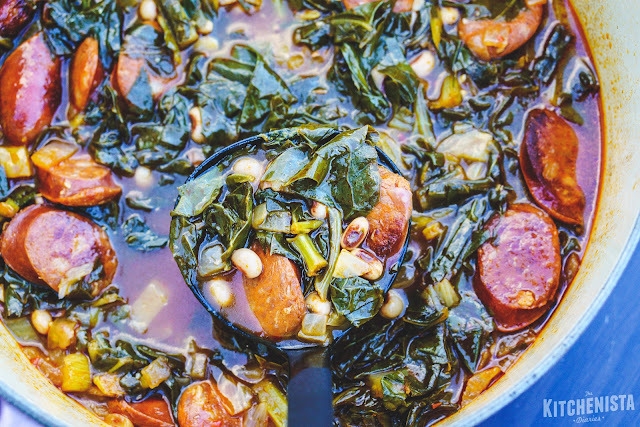 It's a New Year's inspired soup packed with collard greens, spicy chorizo pork sausage and just enough black eyed peas to fulfill the requirement. The best part? It only takes about an hour to put together, and it gets better as leftovers over the next couple days. Once again, I used my favorite Portuguese kale soup as inspiration and changed the ingredients to end up with something slightly new. I love when it's that easy. If you can find rehydrated black eyed peas at the store, the texture will be a little more al dente than canned beans, but less work than starting with dried. That said, I give you permission to use canned beans here. Seriously. I made a sweet potato cornbread to go along with my soup. It was an older recipe that I hadn't made in awhile but the flavors really complemented each other. I'm still tweaking that one and I'd be lying if I said I'd get that up on the blog anytime soon - but I did just post a really great sweet potato biscuits recipe last week. 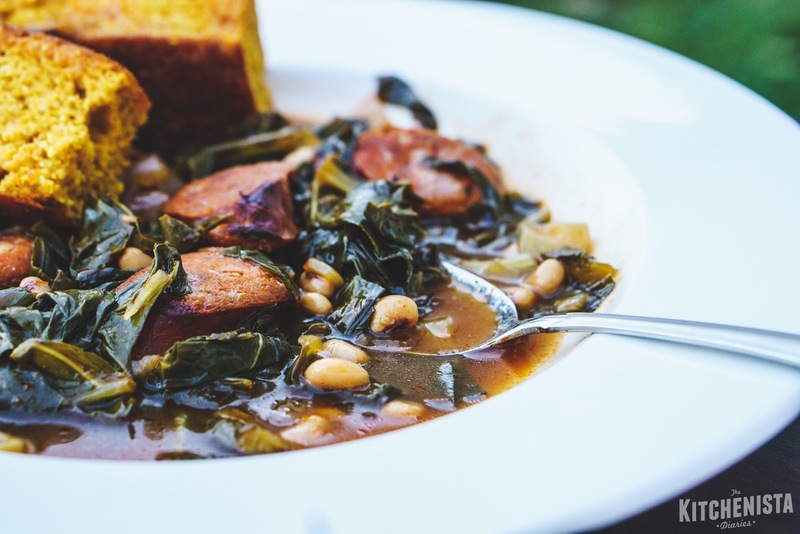 If you'd like to stick to cornbread, check out my Sage Brown Butter or Jalapeno Bacon skillet cornbread recipes for ideas! 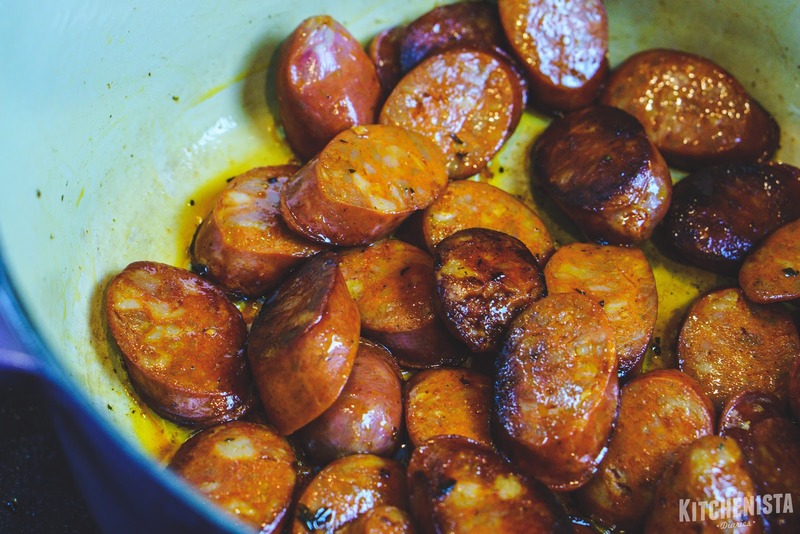 Add butter to the pot over medium heat and brown the chorizo until slightly crusty and caramelized, about 5 minutes. I always sneak a few pieces. 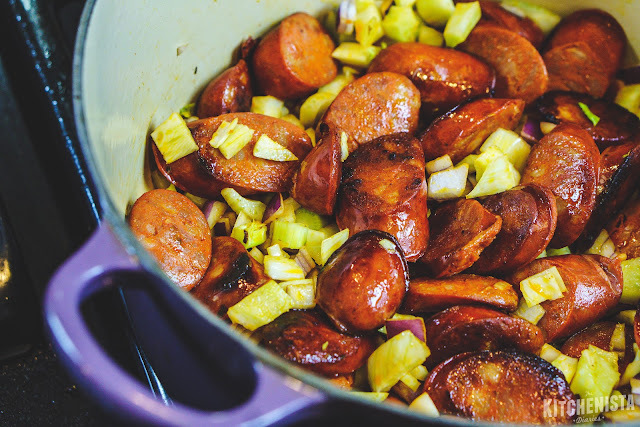 Add the diced onions and fennel to the pot. Season with salt and pepper and continue cooking another few minutes just until the veggies soften. Stir in the garlic, pepper flakes, tomato paste, smoked paprika and cumin. Cook until fragrant, 2 to 3 minutes. Add the bay leaf. Pour in the chicken stock, scraping up any browned bits at the bottom of the pot. Raise the heat and bring the contents of the pot up to a boil. Season the broth with salt and pepper. 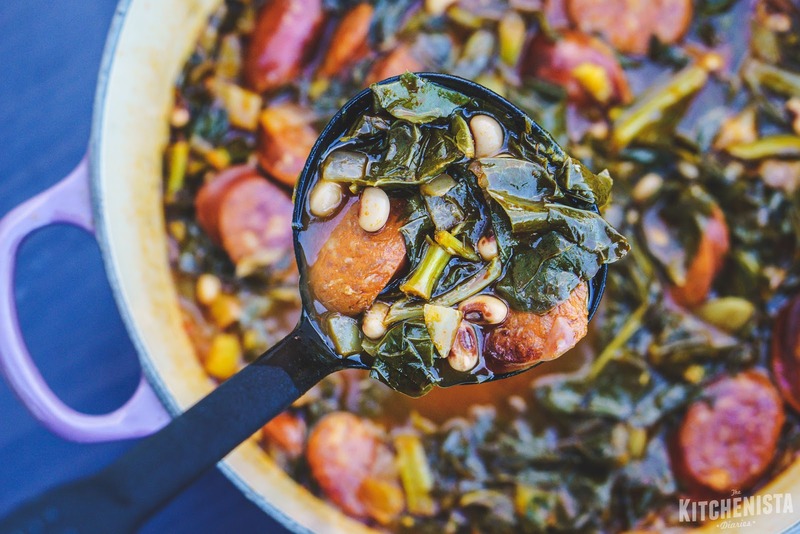 Add the chopped collard greens, stirring until wilted. If you're using packaged rehydrated black eyed peas you can go ahead and add those now. Otherwise let the greens cook for thirty minutes until tender and then add canned beans in the last five minutes just to cook until the beans warm through. Either way, turn the heat back down to a gentle simmer and let the greens cook with the pot lid closed. Told you this was easy. 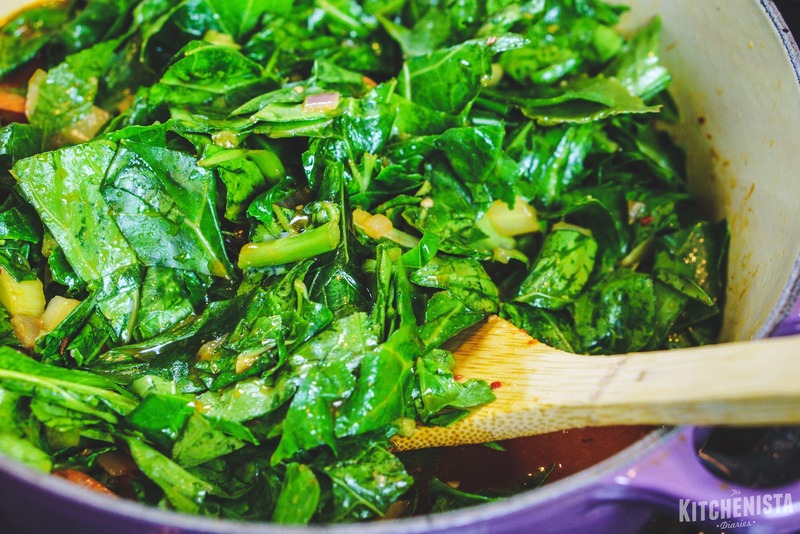 When the greens are silky and tender, discard the bay leaf (you may have to do a little digging.) Finish with apple cider vinegar at the end. You can let it simmer longer if you aren't worried about the beans falling apart a little bit (I wasn't.) 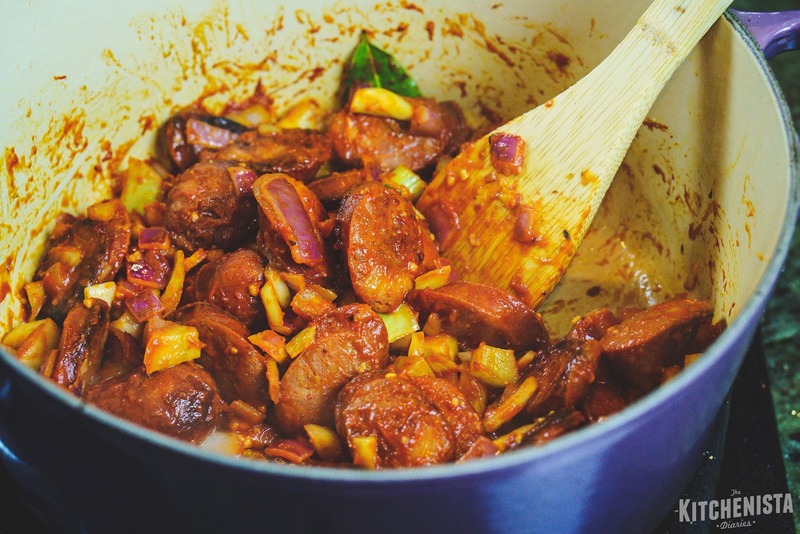 It's also a great one to let cool, transfer to the fridge and reheat the next day when the flavors will have really married even more. I had a good homemade stock and chorizo is such a flavorful sausage to begin with, so I really enjoyed this soup right away! Don't forget to serve that cornbread (or biscuits) on the side! Happy New Year to all of my readers! I'm excited to make some major changes to this blog, and for big moves lying ahead in my professional endeavors. If you haven't already, don't forget to share your #FoodResolution on Twitter or Instagram. Let me know how you'll be eating or cooking differently in 2016. I'll be using your responses to generate some content this month and help you achieve those New Year's kitchen goals! I'm so glad I found your blog!! Your recipes look amazing and are right in my wheelhouse!! I made a dish very similar to this one, but with swiss chard, I think your collards addition will be a banger.. Lol.. Thanks, your blog rocks madam..